The moment you've been waiting for is here! Hooray! I'd love to see more of you this summer and fall at a few of my favorite hang-out spots, where hugs, high fives and gummy bear bribes abound! Sessions can include up to 6 people - immediate family + pets only, please! Clients must be available for both scheduled date AND rain date. Gallery will be sent within 3-4 weeks after session date. 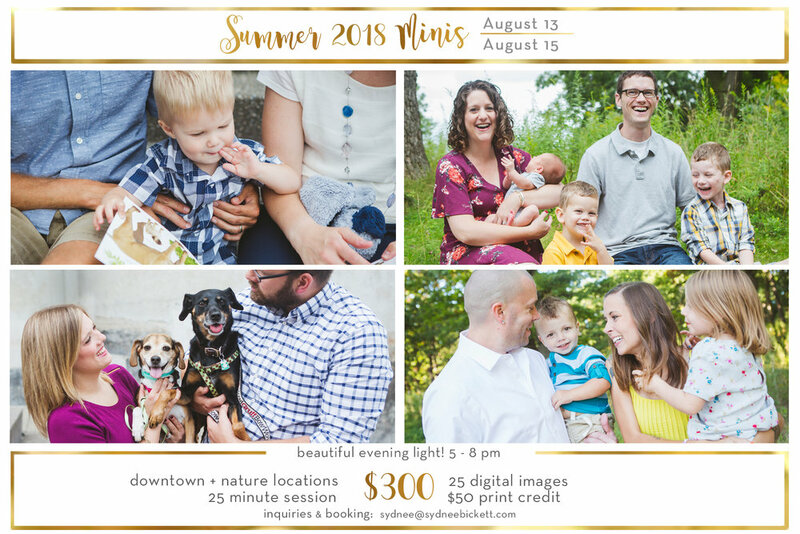 $50 print credit provided with each session - hooray for real life images! LOOKING FOR STUDIO ONLY OPTIONS? To choose your session date & time option (with 2nd choice), send an email to sydnee [at] sydnee bickett [dot] com to get the ball rolling! Upon receipt of your email, I will send you an invoice to pay the $150 fee. 10 days before your session, I'll send another note with information about location, parking, where to meet, what to bring & other goodies! I can't wait to see you all soon!